Anthony Joshua MBE will make the first defence of his IBF World Heavyweight title against unbeaten American Dominic ‘Trouble’ Breazeale at The O2 in London on June 25. Joshua ripped took both the belt and unbeaten record of American Charles Martin at the same venue on April 9, and he’ll be looking to take another ‘0’ in his maiden defence. Breazeale brings a formidable 17-0 record to the UK with 15 wins inside the distance and enters the clash on the back of forcing Amir Mansour to retire after five rounds of their clash in January. The Californian is no stranger to London having represented USA in the 2012 Olympic Games, where Joshua won gold. 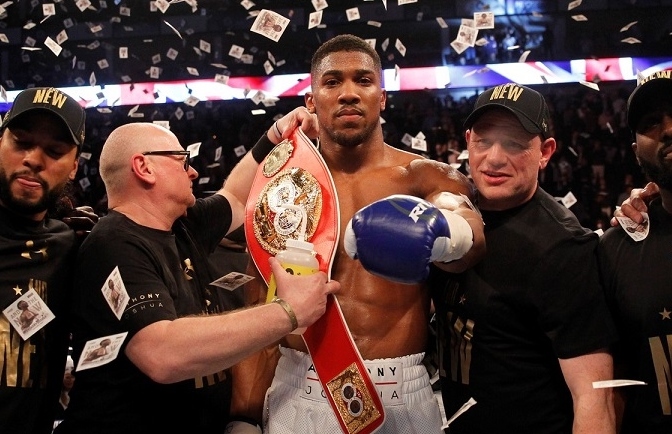 “I can’t tell you how excited I am to fight again, especially at The O2 which I have made my fortress,” said Joshua. “My coaches have watched Breazeale for a long time and they knew he was going to be a player in the division and now we get the chance to go war on June 25. It’s sure to be explosive, both of us like to let our hands go and score knockouts, we are both undefeated and both have Olympic pedigree. A huge undercard is being pieced together by promoter Eddie Hearn, and the first fight announced is a mouth-watering Super-Middleweights George Groves and Martin Murray in an eliminator bout for the WBA crown. Both men are hunting a World title shot in the second half of the year, a fourth in the division for Groves and a first at 168lbs for Murray, who boxed three times for a World crown at Middleweight. ”Martin is the perfect fight for me at this stage. He’s a seasoned campaigner, who’s boxed at the highest level for quite some time. He is a world level opponent and I’ll have to be fully focused and prepared to beat him. Promoter Eddie Hearn added: “June 25 is going to be a huge night from start to finish. It’s great that Britain’s newest super star is staying active, many would have still been celebrating but its back to business for AJ. The fight with Breazeale is going to be explosive- he is 6″7 and is one of the few whose KO ratio is up there with Anthony’s. He has come through the similar elite amateur set up and has worked his way into this shot and is ready to go. Tickets go on sale today (April 25) at 10am to Matchroom Fight Pass members from the Fight Pass area at www.matchroomboxing.com and O2 Priority members at www.theO2.co.uk. Tuesday April 26 at 10am sees the venue and AXS pre-sale before tickets go on general sale at 10am on Wednesday April 27. Tickets priced between £40 to £500 will be available from www.theO2.co.uk and on 0844 856 0202. VIP tickets are £1,000 and available exclusively from Matchroom Boxing www.matchroomboxing.com. Face value tickets for June 25 will also be available from http://www.stubhub.co.uk/matchroom-boxing-tickets/ from 10am on April 27. StubHub is the official ticket partner and marketplace of Matchroom Boxing and Anthony Joshua.